The McCadd’s and me: three of those who started the Extravaganza 25 years ago. This post celebrates a Gospel Extravaganza milestone, but the Extravaganza keeps going past this! In 2018 it passed its 30th ANNIVERSARY, and we invite you to join us on the campus of North Central College, Naperville, IL., for the 31st Extravaganza sometime in late January/early February 2019. More info early next year. 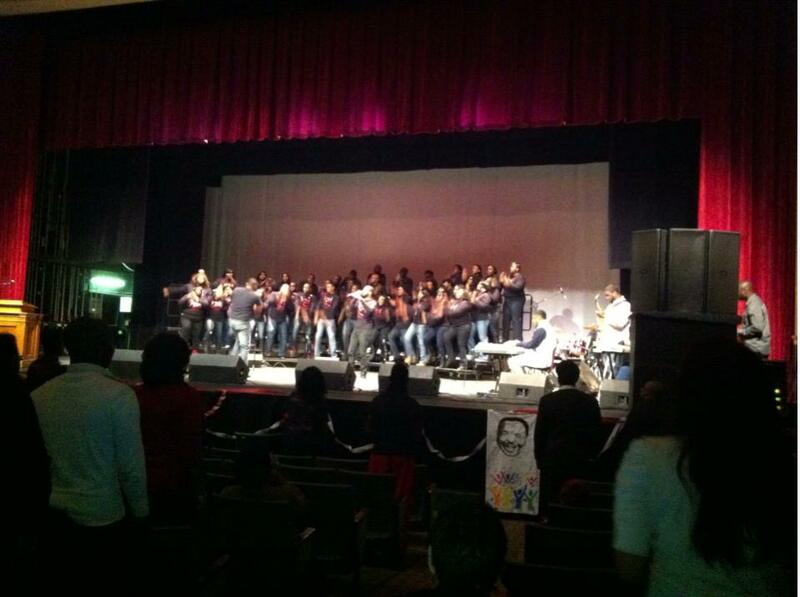 Here’s 4.5 minutes from the 2.5 hour North Central College Gospel Extravaganza, January 2013—ITS 25th ANNIVERSARY! Students created it that long ago with me as their advisor and support, emotional and logistical. Two of those students who returned for this Anniversary, Harold and Gerald McCadd, are pictured here with me. I’ve written a longer piece, “Father Mike Pfleger and Other Gospel Extravaganza Memories,” you can read at the link below. For now, enjoy the video. I shot it on my cell phone, which managed to capture about 25% of what the music sounded like—if you plug in to speakers or use headphones—but only 5% of the electric spirit of praise in the room no matter what you plug into. It’s a little taste of an event that usually occurs the last Saturday of every January or in early February. ♦ Watch moments from Gospel Extravaganza 26, GOSPEL EXTRAVAGANZA 30, and read about Gospel Extravaganza 28. ♦ Read Father Mike Pfleger and Other Gospel Extravaganza Memories. ♦ Go to a video of Martin Luther King, Jr.’s “Riverside Sermon,” and follow links there to other MLK material. The sermon was perhaps his most courageous, and miles away from “I Have a Dream.” The Gospel Extravaganza often marks the transition between January celebrations of Dr. King into programming for Black History Month. This entry was posted in Diversity & Multiculturalism, Faith, Music & Media Podcasts and tagged Father Mike Pfleger, Gerald McCadd, Gospel Extravaganza, Gospel music, Harold McCadd, North Central College, Richard Guzman. Bookmark the permalink. How can this be. I’ve been here about 15 years & never heard about this before!. This should be recorded, song by song, on a bigger camera, and posted on I-Tunes, GodVine and Facebook. Obviously worth sharing with the world! God bless y’all for holding this event even ONCE!